We don’t know which is a worse candidate for the most liked photo on Instagram: something outrageous or nothing special. The Internet has spoken and netizens chose the latter. 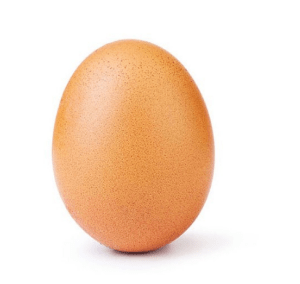 It was reported that 25 million people liked a photo of a single egg on a white background, beating Kylie Jenner’s birth announcement by far after she hid from the public eye during her pregnancy. Jenner’s post garnered almost 18 million. It had every intention to be seen, as it tagged some major news sites and viral story outlets. The identity behind the account is yet to be confirmed. This brings us to infinite questions. Is this an experiment to determine how far social media can go? Who posted it? What was the whole purpose? Well, eggs are indeed a gift to humanity, so there’s that. That’s the digital world for you, because even when there are millions of so-called influencers and vloggers trying their hardest to create the best content, all armed with high tech cameras, expensive designer outfits, and set in the world’s hottest destinations, a single egg can still merit all their coveted likes. Even the world’s most respectable figures, ones who really deserve to be called influencers, and those who have important messages to say couldn’t compare.